Actually, I did get the back of the birdhouse painted yesterday as well, so I'm not as behind as I tease. It's sitting in my studio, waiting to be sandwiched and stitched into shape. My mind is on the roof, how to construct the clever idea I had and whether it will look as nice as I dream. This side has a tufted titmouse, whereas the front had a chickadee. The rest of the quote will go back here. 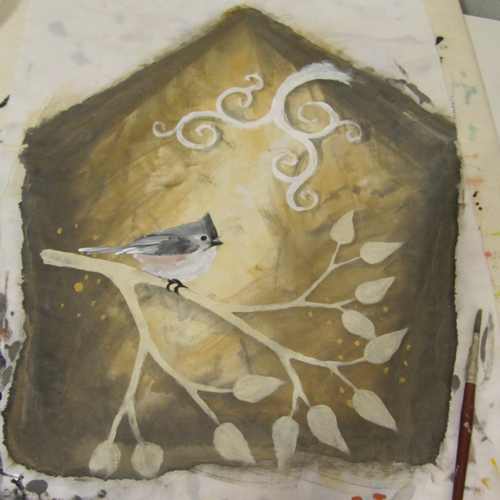 I need more paint to define the bird, too, and black outlining to make the scrolls and branch pop. Your drawings are gorgeos and your iPhone is the prettiest ever !